Santa Claus is one of the world’s most recognized characters. He is literally everywhere during the Christmas season. Santa Claus’ face is on millions of greeting cards, and thousands of his clones are making their presence at shopping malls around the world. But who exactly is Santa Claus? 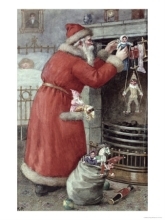 This article discusses the different versions and legends of Santa Claus. Santa Claus is the American version of the famous gift giver. In his previous incarnation, Santa was Saint Nicholas—a legendary figure renowned for his clandestine gift giving. The current incarnation is a white-beard man named Santa Claus, who lives at the North Pole with his wife Mrs. Santa. Every Christmas, the man makes a list of well-behaved children and distributes special gifts to those on the list. He is aided by his trustful elves and magical flying reindeer. It should be noted that Santa Claus usually delivers the gifts in secret, visiting each child’s home through the chimney. Each year, thousands of American kids send letters addressed to the North Pole. Each letter contains a list of holiday wishes (mostly for material things such as toys and video games.) Unfortunately, the North Pole is an undeliverable address. To maintain its high standing with young kids, the U.S. post office commissions its own Santa to aptly deal with each letter. European children have their own version of Santa Claus called Pere Noel (French) or Father Christmas (English). Father Christmas is a slimmer and more serious-looking old man. He does not have a brand-name flying sleigh to ride on or some little elves to help fix his belly. He does not have expensive toys to give, only some candy to spare. Unlike Santa Claus who refuses to give naughty kids anything for Christmas, Pere Noel leaves a wooden cane at the door of each of the naughty kids’ home so their parents can give them a good spanking. A friend who lives in Russia recently provided me with some interesting insights with regards to Father Frost--the Russian version of Santa Claus. Here is his description of Father Frost. I’m not sure about the two beautiful helpers, but I would love to see Father Frost makes a cameo in a rap video.